There’s nothing better than hitting the open water on a hot day and casting a line to reel in a great catch (or maybe a few). The water is so cool and soothing, and just being near it instantly makes you feel refreshed. But there are some downsides to fishing in the hot weather. Obviously, the heat itself can be a major drag. The longer you’re out, the hotter you get. There’s also a matter of the sun to contend with. The harsh UV rays of the sun can lead to blistering sunburns. Sure, you can apply and reapply sunscreen, but what happens if you forget it, or if you just can’t put it on when you’re perfectly positioned with your rod and reel? There’s a way that you can protect yourself from the scorching heat and sun. How? – By wearing a long-sleeved fishing shirt. You’re probably thinking to yourself, “Why on earth would I want to wear a long sleeved shirt when it’s hot as heck outside?” It kind of seems like a silly idea, doesn’t it? After all, a long sleeved shirt will only make you sweat more! 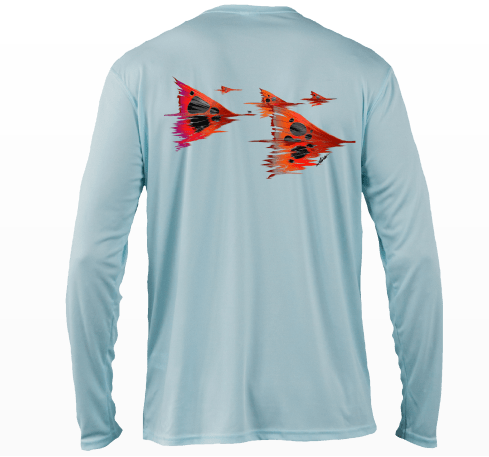 But, believe it or not, experienced anglers recommend wearing long sleeves while fishing in hot weather. Why? – Because it’s one of the easiest ways to keep your arms protected from the sun’s damaging rays, which can help to stave off a killer sunburn. But won’t wearing a long sleeved shirt in the scorching heat make you even hotter? Not if you’re wearing long sleeves that are made out of the right type of material! In fact, if you choose the right material, a long sleeved shirt can actually cool you down in the hot weather. 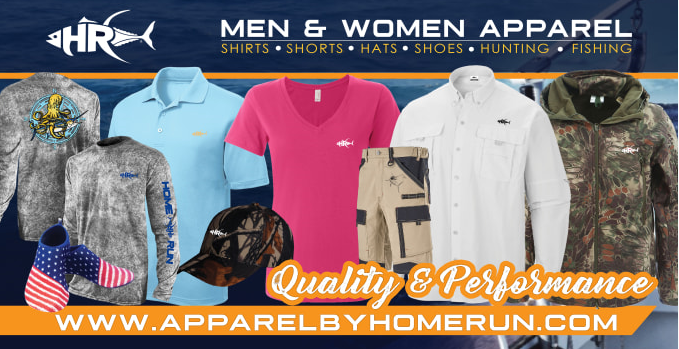 So, what type of material should you consider for upf sun protection fishing shirts? Poly HD! 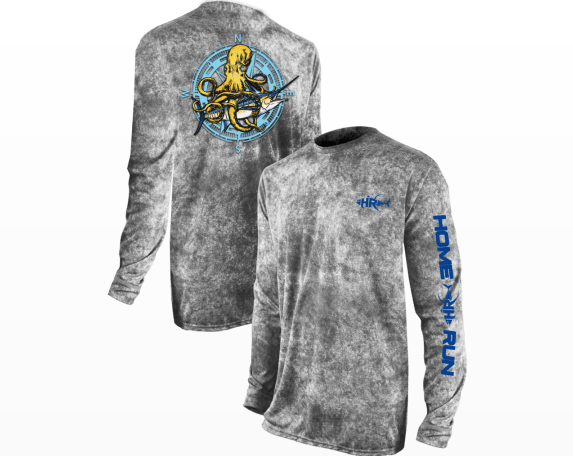 This revolutionary material features moisture wicking and quick dry technology. It actually blocks out excessive humidity and keeps air flowing around your body instead of trapping it inside. In other words, Poly HD will keep you cool and dry, even when you are fishing on the hottest day of the year. To further add to incredible benefits of Poly HD, this material is also UPF 50+. It blocks out the harsh, damaging rays of the sun, significantly reducing your chances of getting a burn. That means that you don’t have to worry about constantly reapplying the sun block while you’re in the middle of casting (of course, we recommend applying block before you head out and reapplying it as often as you can for maximum protection). Poly HD is also anti-bacterial and odor resistant, which means that nasty odors won’t get trapped inside and you’ll smell fresh all day long (well, except for the smell of bait, but there’s really no way to avoid that). And, last but not least, Poly HD is so easy to care for. Just toss it into the washing machine, tumble dry, and it will be as good as new!